For fighter info, see Yoshi (SSB), Yoshi (SSBM), Yoshi (SSBB), Yoshi (SSB4), and Yoshi (SSBU). For the universe, see Yoshi (universe). Official artwork of Yoshi from Mario Party 10 and Yoshi's Crafted World. 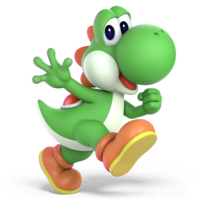 Yoshi (ヨッシー, Yoshi) is a character in the Mario series. Since his debut in Super Mario World, Yoshi's popularity has resulted in him starring in his own series, which follows his and his species' adventures. As a member of the "perfect-attendance crew", Yoshi has been featured as a playable character throughout the Super Smash Bros. series. 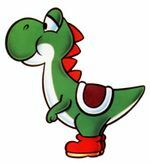 Official artwork of Yoshi for Super Mario World. This appearance inspired his design for Super Smash Bros. and Super Smash Bros. Melee. 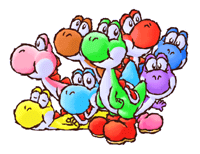 Yoshi is the most recurring member of the sentient, multicolored dinosaur species of the same name. 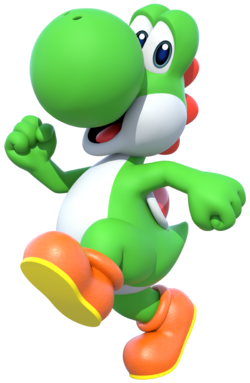 He debuted in Super Mario World, where Mario or Luigi would be able to find Yoshi Eggs, which would hatch automatically to reveal a fully grown Yoshi. Later in the game, Baby Yoshis could also be found. Baby Yoshis can be held and tossed around like a shell. However, they can mature into a fully grown Yoshi upon eating five enemies, and thereafter be mounted. 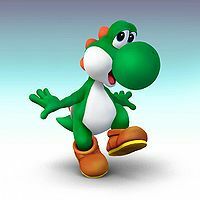 Alongside Yoshi himself, three differently colored Yoshis were introduced, each of which has a distinct special ability that can be used so long as they have a Koopa Troopa shell in their mouths. Blue Yoshi can fly; Red Yoshi can breathe Fireballs; and Yellow Yoshi can emit a sand cloud after landing a jump. While Yoshi himself does not have any distinct special abilities, he can use each of the three other Yoshis' abilities by holding a shell of the same color as the respective Yoshi, such as a red shell allowing him to breathe Fireballs. By extension, the other three Yoshis can do the same. Due to Shigeru Miyamoto's dislike of subsequent Yoshi games, he aimed to make a game starring Yoshi that was authentic to his character. This game would come to be known as Super Mario World 2: Yoshi's Island, which saw the original four Yoshis joined by more members of their species. 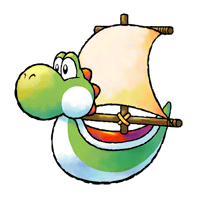 Yoshi's Island also saw the original four Yoshis sport updated and/or new abilities that since become standard for their species as a whole since then. The Yoshis' ability to eat virtually anything was expanded to include the ability to create Yoshi Eggs capable of being thrown. In addition, the Yellow Yoshi's sand cloud-generating jump was modified into a Ground Pound usable by any other Yoshis. Outside of these updated abilities, the Yoshis also gained the ability to Flutter Jump and transform into certain vehicles. In addition to being the first installment of the Yoshi's Island sub-series, Super Mario World 2 is the first installment in the Mario series' in-universe timeline: it details Baby Luigi being captured by Kamek while being delivered by a stork, while Yoshi and his fellow Yoshis discover the missing Baby Mario and work to rejoin him with his twin brother. 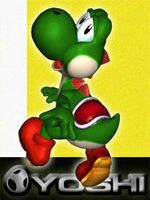 Official artwork of Yoshi in Super Smash Bros.
Yoshi makes his first appearance in a fighting game in the original Super Smash Bros. as a starting playable character. His design is based on his appearance from Super Mario World. In comparison to the rest of the roster, Yoshi is arguably the most unique. His shield is unique, as it is a Yoshi Egg instead of a standard bubble that shrinks, which makes him immune to shield stabbing. Another noticeable distinction Yoshi possesses is his lack of a recovery move. Instead, he makes up for it with a massive and generally safe double jump. Although Yoshi's unique traits make him rather difficult for beginners to learn, his very versatile combo options, most notably his double jump canceled aerials, are very useful for combos, pressuring and KOing. Thanks to his strengths, Yoshi is currently ranked 5th on the tier list, placing him in the A tier. Yoshi is the friendly dinosaur of Yoshi's Island. He began as Mario's partner, but has since built his own identity, and now appears in many games. He uses his unique ability to turn whatever he swallows into an egg as his foremost attack. Yoshis come in a rainbow of colors and are said to have a high IQ from a very early age. Yoshi, as he appears in Super Smash Bros. Melee. Yoshi returns in Melee as a starting playable character. His design is still based on his appearance from Super Mario World. Yoshi stays relatively unchanged, but is given a few new visual properties, such as a more dinosaur-like posture. He has also received several new and unique techniques, such as edge-canceled eggs. Although Yoshi can continue to double jump cancel, he was somewhat nerfed; he is now unable to jump out of his shield and continues to lack a third jump, two distinct traits that must be adapted to in order to bypass their drawbacks. However, Yoshi's unique shield physics, agile yet heavy hurtbox, and powerful attacks nonetheless make him a capable character. While Yoshi was initially regarded poorly, his position in the current metagame has improved significantly, due to recent high tournament results by particular Yoshi professionals, notably aMSa. As a result, he is currently ranked 12th on the tier list, placing him in the D tier. Yoshis are gentle, fleet-of-foot dinosaurs that make their home on idyllic Yoshi's Island. They come in a variety of colors and have evolved an interesting trait to help increase their numbers: they can transform anything they swallow into an egg. With adhesive tongues and bottomless bellies, Yoshis have been known to eat anything. Yoshi, as he appears in Super Smash Bros. Brawl. Yoshi once again returns as a playable character in Brawl. Unlike in SSB and Melee, he now sports his design from Yoshi's Story. His moves are relatively unchanged from his Melee moveset, except for the fact that his up special move, the Egg Toss, can now function somewhat as a third jump when used in mid-air. This is a welcome change for Yoshi, especially since his already fast air speed has become even faster, and the directional air dodge that aided his recovery in Melee has been removed. Yoshi also boasts a much better grab game, thanks to receiving grab release follow-ups. However, alterations to Yoshi's double jump and aerial Egg Roll's momentum have significantly harmed his recovery, while his new grab release follow-ups do not fully compensate for the loss of his double jump canceled combos. Like other characters, Yoshi has received a Final Smash; in his case, it is Super Dragon. Super Dragon involves him growing angelic wings that allow him to fly and gaining the ability to breathe fire either as a powerful Fireball or a stream of flames, while he is rendered invincible throughout its duration. As a result of the severity of his nerfs, Yoshi is currently ranked 27th on the tier list, placing him in the D tier. A creature that hails from Yoshi's Island. Yoshi's come in a variety of colors, and all possess gentle personalities. No matter what problems they face, they always look like they're having fun. Yoshi's use their long tongues to grab and swallow fruit and enemies. They can convert what they swallow into eggs, which they then lay. They also give Mario rides. Yoshi, as he appears in Super Smash Bros. 4. Yoshi returns as a playable character in Super Smash Bros. 4. Unlike in Brawl, Yoshi's overall color scheme is considerably brighter. He also he appears more cartoony and now stands in a more upright position, all of which make him appear much more in line with his appearances in the latest Mario and Yoshi games. Yoshi has been buffed in the transition from Brawl to SSB4, with increased speed and utility to his moveset, while his decent dashing speed has become considerably faster. His aforementioned altered posture is also a buff, as it makes his hurtbox's positioning less awkward. Yoshi's KOing options and set-ups were also improved, while he also regained the ability to jump out of shield, something he could not do since SSB. His shield was further buffed by his shield drop becoming much quicker. However, Yoshi also received nerfs to his overall damage output. His grab game has been also drastically nerfed, as the removal of chain grabbing removed his useful grab release follow-ups. Despite his improved shield, Yoshi's rolls are still short-distanced, limiting his ability to escape from pressure. Overall, Yoshi's buffs are significant enough to have noticeably improved his viability from Brawl. To reflect this, Yoshi is currently ranked 34th on the tier list, placing him in the D tier. While Yoshi has a minimal presence in competitive play despite this strengths, he has achieved varying degrees of success regardless. This includes winning a few local tournaments in both singles and doubles play, and achieving several top 50 placings (some of which are top 10 placings) at regional and national tournaments. This heartwarming contraption looks more at home in a theme park than a raceway, but don't be fooled—this egg-shaped frame can dive under the sea or soar through the skies with ease! Your opponents will be filled with envy when you break this out in Mario Kart 7. This kart combo looks like it belongs in a theme park rather than on a racetrack. But, of course, looks can be deceiving! The egg-shaped frame known as the Egg 1 is a speed demon in the water. Mario Kart 7's tracks include everything from deep blue seas to soaring slide routes, so you've got to be prepared for anything! Yoshi is confirmed to be a playable character in Super Smash Bros. Ultimate. He now has a new alternate costume based on his appearance in Yoshi's Crafted World, which replaces his Black Yoshi costume. Not only that, but to align with the new idea of final smashes being changed to be faster, his previous final smash has been replaced with Stampede!, which is based off of his appearance in the intro of Melee. In addition, a Mii Costume based on Yoshi's appearance from Yoshi's Woolly World is available for Mii Brawlers. Although Yoshi is a heavyweight in the Super Smash Bros. series, this is highly unusual in comparison to his weight classification in the Mario Kart series. 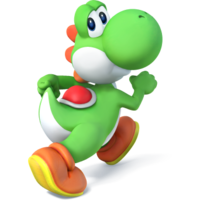 Yoshi is characterized as being the fastest of the lightweights in Super Mario Kart and Mario Kart 64, and has been a middleweight as of Mario Kart: Double Dash!! He shares this quirk with Bowser Jr.
Rosalina follows an inversion of this quirk. She is a heavyweight in the Mario Kart series, yet is a lightweight in the Super Smash Bros. series. Yoshi is the only character in the Super Smash Bros. series to use the same set of voice clips since SSB. 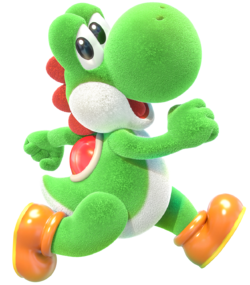 Unlike other non-human Mario characters, such as Bowser and the Donkey Kong characters, Yoshi is also one of nine non-human Mario characters to retain their standard voice clips from the games they appear in. The other eight are Bowser Jr. and the Koopalings. Yoshi is the only character to have a unique shield. In his case, it is a Yoshi Egg instead of a bubble. Prior to SSB4, the color of the Yoshi Egg used during Egg Roll and Egg Throw would remain white with green spots, regardless of Yoshi's selected color scheme. Yoshi is the only member of "The Original 8" to not appear in the SSB4 E3 2013 trailer. He is also only the member to not be playable in Ultimate's E3 demo. As of Brawl, he is the last of the "Original 8" to be revealed as a veteran for a subsequent Super Smash Bros. game. He was also the only one in Brawl to be confirmed on the Smash Bros. DOJO!! before appearing in a trailer. "Melee" marks the latest time Yoshi was not revealed last. Yoshi and Captain Falcon are the only singular representatives to appear throughout the Super Smash Bros. series. He is also the only singular representative to consistently remain a starter character throughout the Super Smash Bros. series. He is also the only member of "The Original 8" to remain a singular representative, since the other members have been joined by other representatives either in their debut or in later installments. He is also the only "Original 8" member to have no Assist Trophy or item representation for the Yoshi series, discounting Yoshi's Egg. He and Wario are the only Mario characters to be sole representatives of their sub-universes. Including sub-franchises, Yoshi is the only Mario representative to not have "Congratulations" written in Mario-themed font in his congratulations screen in SSB4. Prior to Brawl, Yoshi and Jigglypuff were the only characters whose up special moves could not be used for recovery. Yoshi's punching victory pose is likely a humorous reference to one of Akuma's victory poses or his Raging Demon (瞬獄殺, Blinking Prison Killer), which concludes with an identical pose. This is even referenced in Ryu's All-Star Mode congratulations screen in Super Smash Bros. for Wii U.
Yoshi, Piranha Plant, Inkling, R.O.B., the Mii Fighters, and the Pokémon are the only playable characters to share their name with their respective species. Yoshi is the only heroic playable reptilian character, not counting Charizard and Squirtle (as Pokémon, by nature, are not morally aligned) and Corrin (who is half-human). Counting sub-universes, he is also the only reptile in the Mario universe to be a protagonist. Yoshi, Luigi, Snake, Wario and Corrin are the only playable characters to feature material from games scheduled for release after an installment of Super Smash Bros. - in Yoshi's case, Yoshi has a stage based on various levels from Yoshi's Woolly World in SSB4, and an alternate costume in Ultimate based on his appearance in Yoshi's Crafted World. ↑ The Ultimate History of Video Games: The Story Behind the Craze that Touched our Lives and Changed the World, p. 518. This page was last edited on April 10, 2019, at 03:52.